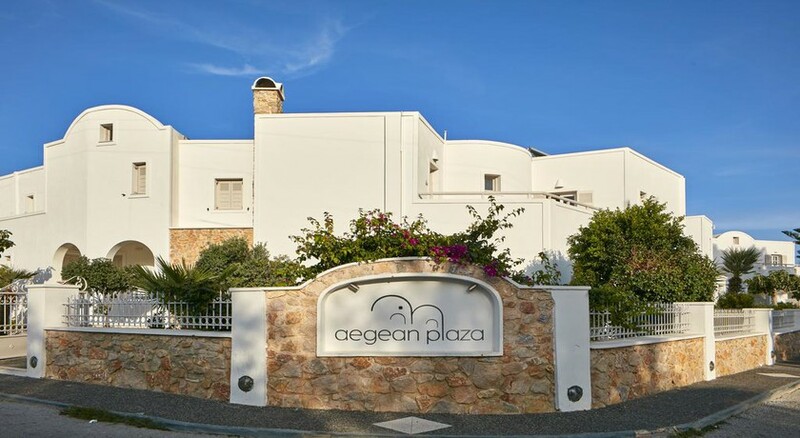 The Aegean Plaza Hotel is a beautiful hotel exhibiting true Cycladic architecture. The hotel has brilliant hues and accents of blue against a white backdrop that only extenuate the architecture. This luxurious hotel offers spacious and comfortable guestrooms all featuring air conditioning, private bathroom with bathtub, internet access, direct dial telephone, a hair dryer, in-room safe, etc. Upgraded rooms have their own kitchens and balcony or terrace offering lovely views of the sea and the swimming pool. The onsite restaurant serves excellent Mediterranean cuisine; guests can enjoy the views of the swimming pool from the restaurant. The hotel also houses a pool bar that serves freshly made cocktails and light bites. There’s also an inviting spa and a state of the art fitness centre. The Aegean Plaza Hotel is just 100m from a fine black sandy beach and is located in magnificent Kamari on the island of Santorini. The hotel is located very close to the Santorini airport at 5.5km, making it convenient for guests to reach the property and board their flights back on time. The island of Santorini is home to several archaeological sites. One such site is Ancient Thera, which is named after the ruler Theras. This site is only 3.3km from the hotel. There’s also an open air cinema close to the hotel called the Open Air Cinema Kamari, which is only 1km away. The cinema is often considered the best in open air cinema Europe. 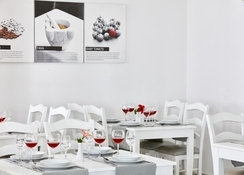 Featuring over 120 guestrooms, the Aegean Plaza Hotel is a luxurious hotel in Santorini. The guestrooms are categorised as standard room, studio room and suite room. 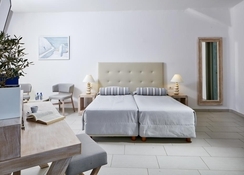 The rooms have a modern décor coupled with traditional Cycladic architecture. Amenities in the rooms include telephone, flat screen television, safety deposit box, air conditioning and balcony or terrace. All guestrooms come with a king-size bed or two twin beds, free Wi-Fi, safe, tea & coffee making facilities, en suite shower, satellite TV, mini-fridge, radio, hair dryer, continental socket, in-room hair dressing services, iron and ironing board available on request and much more. Most rooms offer excellent views of the sea. The Aegean Plaza Hotel features an excellent restaurant and a pool bar. The restaurant serves an American breakfast, which can also be had in the guestrooms. A part of the restaurant is al fresco, allowing for guests to enjoy excellent views of the surroundings and sea. The pool bar serves a variety of freshly made cocktails and several beers. It also serves light bites. Located in lovely Santorini, the Aegean Plaza Hotel offers amazing views of the sea. The three swimming pools invite guests for a relaxing swim. There’s also a separate swimming pool for children. All the pools are filled with fresh water. Sun loungers and parasols are fitted around the pools and enable guests to sun bathe or simply relax with a cocktail in hand.